Just follow the steps and images shown below and in a matter of minutes you will have your own wishlist for all your admirers to purchase just for you. Just click on the “Login” link at the top right of your screen. Underneath “Register” add the email you would like to use and create yourself a password, so you can login again at a future date. You will automatically log in to your new account. This is your main dashboard where you will be able to see all your different wishlists, and change personal information if you need to. 3) Now you can add the shipping address you would like your gift sent to. Please know that you must include a physical address, as W/we do not ship to P/O Boxes. To Add Your Shipping Address just click the “Addresses” link on the left hand side. click on the link “wishlist” on the top right of your screen and select create a list. and you can name your wishlist, had a description and choose what kind of wishlist it will be. 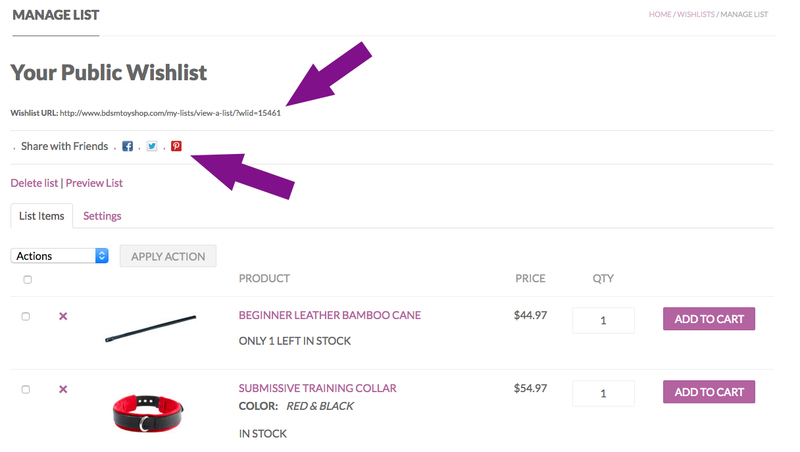 Once your list is created you can start adding items in the shop to your wishlist. At any time click the “Wishlist” link at the top right of your page and select “Manage List” This will take you back to your account dashboard where you can see all the wishlists you have created. Select the wishlist you want to share. Your Wishlist URL: At the top of your wishlist page you will see a unique url. You can place this url on any account you have (ie blog, tumblr) send it in an email to anybody who might be interested in spoiling you. Any time anybody sees and clicks one of your links they will be able to see your wishlist and be able to purchase you any of the gifts you desire. They will never know your personal information or be able to access your personal information. You will be able to feel safe and secure knowing that your wishlist will keep your anonymity.